b) the rate of change in the stresses caused by lunar tides in the Earth's atmosphere and oceans, as a result of a change in the direction of the lunar tidal forces, should reach a maximum every 1.89803 tropical years (= 2.0 Draconic year). Interestingly, the time period of the positive side-lobe is almost exactly the same as that of the Quasi-Biennial Oscillation (QBO). The QBO is a quasi-periodic oscillation in the equatorial stratospheric zonal winds that has an average period of oscillation of 28 months, although it can vary between 24 and 30 months (Giorgetta and Doege 2004). 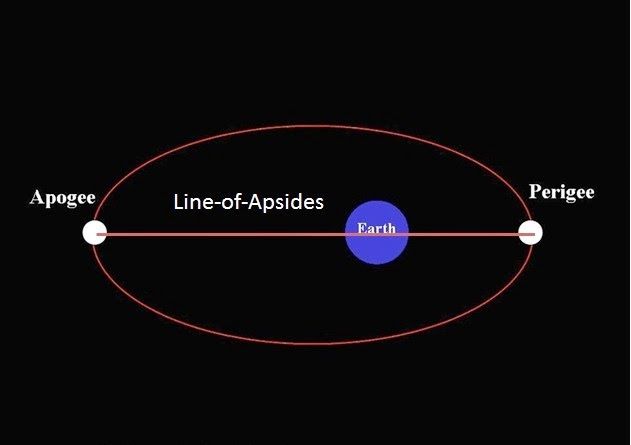 Of even more interest is the 1.589(9) tropical year negative side-lobe period, which just happens to be synodic period of Venus and the Earth = 583.92063 days = 1.5987 years, to within an error of ~ 1.8 hours). 1. The rate of change of the Moon's tidal stresses upon the Earth's atmosphere and oceans - When is it maximized? The stresses caused by lunar tides in the Earth's atmosphere and oceans should be a maximum when the tidal forces of the Moon acting upon the Earth change by the largest amount in either strength or direction over a relative short period in time. a) Changes in lunar tidal strength. 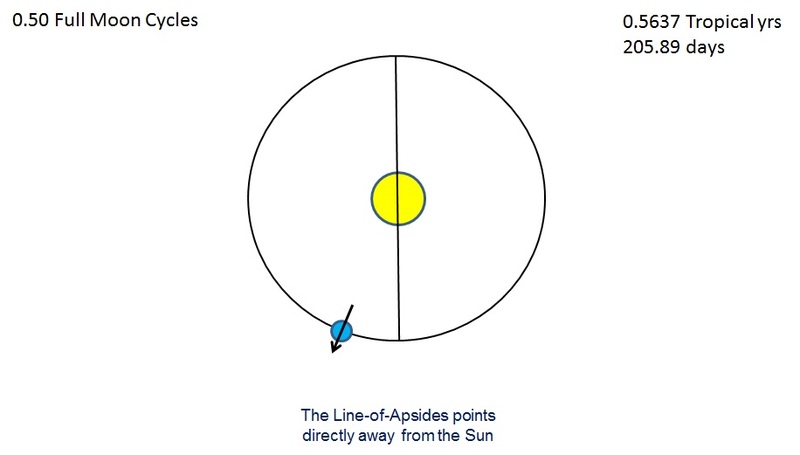 When a new/full moon occurs at or near the times when the lunar line-of-apse (see figure 1) is pointing towards the Sun. This is true because a new/full moon at closest perigee produces the strongest lunar tidal forces upon the Earth while a new/full moon at apogee produces the weakest lunar tidal forces upon the Earth (see figure 2). Thus, when the new/full moon takes place very close to perigee it will be followed roughly 14 days later by a full/new moon not far from apogee. 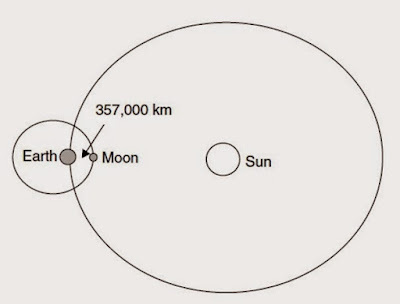 Similarly, when the new/full moon takes place very close to apogee it will be followed roughly 14 days later by a full/new moon not far from perigee. 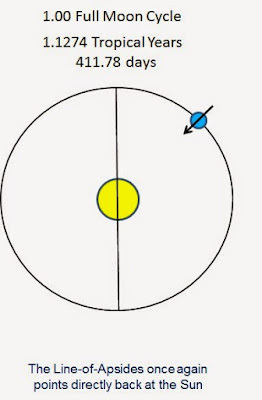 minimal tidal forces upon the Earth because of its distance (i.e. We are looking for the times when the stresses caused by lunar tides in the Earth's atmosphere and oceans will be a maximum because the direction of the tidal forces of the Moon acting upon the Earth are changing by the largest amount over a relative short period in time. 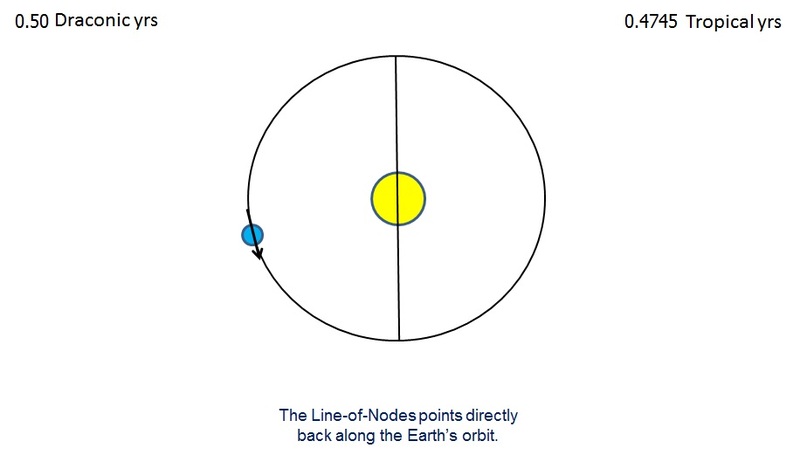 When a new/full moon occurs at or near the time when the lunar line-of-nodes is at a right angle to the Earth-Sun line (see figure 3 and 4). 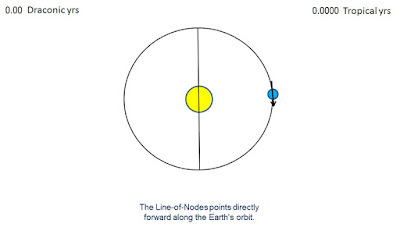 This is true because a new/full moon at a major lunar standstill produces the largest changes in the meridional (north-south) lunar tidal forces upon the Earth (see figure 4). 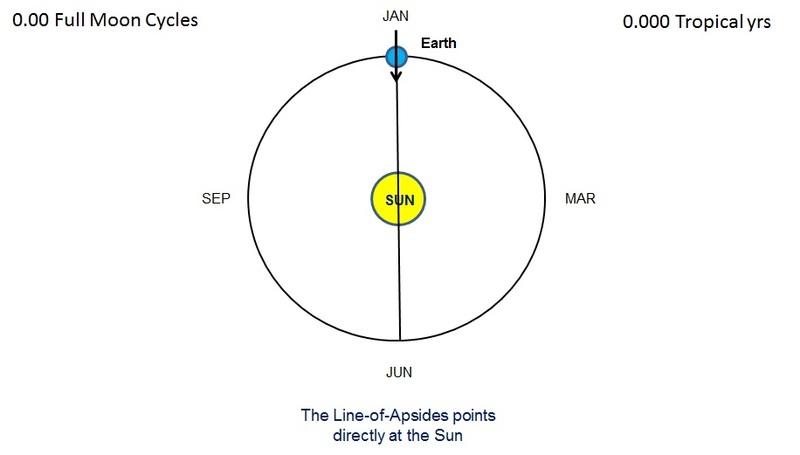 Hence, when the new/full moon takes place very close to a time when the lunar line-of nodes is at a right angle to the Earth-Sun line (i.e. the new/full moon is at a major lunar standstill) it will be located at a declination of roughly 28 degrees in one hemisphere, followed roughly 14 days later by a full/new moon located at a declination of roughly 28 degrees in the other hemisphere. 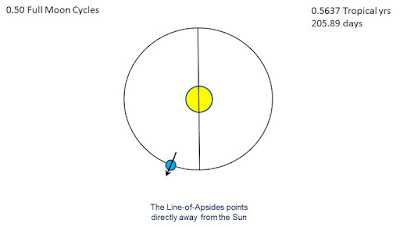 Hence, the maximal rate of change in the strength of the lunar tidal forces acting upon the Earth should vary with a period set by the minimum time required for the lunar line-of-apse to realign with the Sun, at the same time as a new/full moon is taking place. 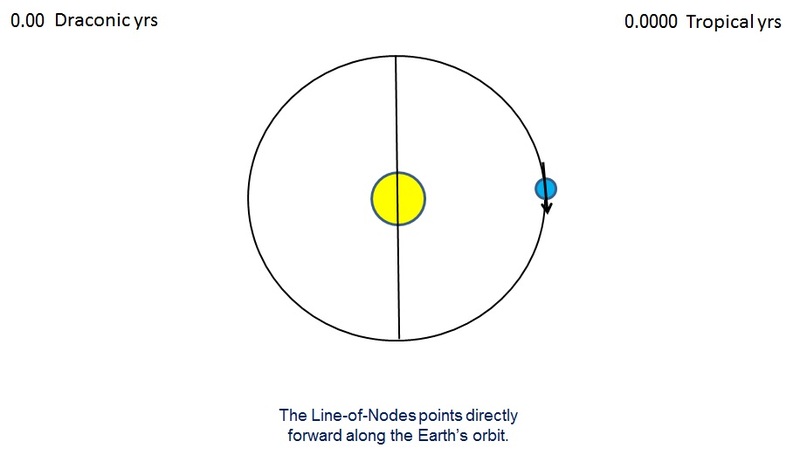 In addition, the maximum rate of change in the direction of the lunar tidal forces acting upon the Earth should vary with a period set by the minimum time required for the perpendicular to the the lunar line-of-nodes to re-align with the Earth-Sun line, at the same time as a new/full moon is taking place. Starting out with a new moon at perigee with the Perigee end of lunar line-of-nodes pointing at the Sun (see figure 5). The Moon almost returns to being New at perigee after 1.0 FMC because 14 Synodic months = 413.42824 days and 15 anomalistic months = 413.31825 days. The Moon almost returns to Full Moon at apogee after this period because 125.5 synodic months = 3706.08891 days and 134.5 anomalistic months = 3706.08698 days. Note that there is a mismatch of only 0.029 days between 125.5 Synodic months and 9.0 FMC which means that this realignment period is about four times more precise than that at 0.5 FMC realignment period. Starting out with a New Moon at a major lunar standstill (i.e. 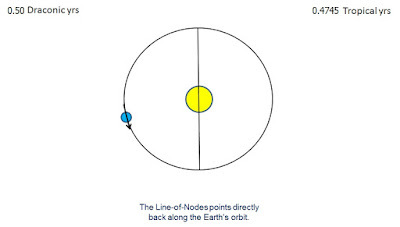 the line-of-nodes is at right angles to the Earth-Sun direction). Unfortunately, 173.310038 days is 5.869 Synodic months and 6.369 Draconic months and so the Moon phase is not new or full. The 1.89803 tropical year period is part of the 19.0 year Metonic Cycle with the Moon's phase returning to new moon at a node after 3.79606 tropical yrs = 1387.481264 days (since 47 Synodic months = 1387.937678 days and 51 Draconic months = 1387.82322 days). With this cycle, the synodic lunar cycle realigns with the seasonal calendar every 4 tropical years, 4 + 4 = 8 tropical years, 4 + 4 + 3 = 11 tropical years, 4 + 4 + 3 + 4 = 15 tropical years and 4 + 4 + 3 + 4 + 4 = 19.0 tropical years. to give and average spacing of roughly (4 + 4 + 3 + 4 + 4)/5 = 3.8 years. b) the rate of change in the stresses caused by lunar tides in the Earth's atmosphere and oceans, as a result of a change in the direction of the lunar tidal forces, should reach a maximum every 1.89803 tropical years (= 2.0 DYs). Interestingly, the time period of the positive side-lobe is almost exactly the same as that of the Quasi-Biennial Oscillation (QBO). The QBO is a quasi-periodic oscillation in the equatorial stratospheric zonal winds that has an average period of oscillation of 28 months, although it can vary between 24 and 30 months (Giorgetta and Doege 2004). Even more interesting, is the 1.589(9) tropical year negative side-lobe period, which just happens to be synodic period of Venus and the Earth = 583.92063 days = 1.5987 tropical years, to within an error of ~ 1.8 hours). Many scientists deny that factors external to the Earth can have a significant impact upon the Earth's climate yet there is considerable evidence that this indeed the case. Their instincts tell them that they must always look for internal factors, and internal factors alone, to explain the Earth's climate systems. Most will admit that Moon might have some influence upon the Earth's climate through the dissipation of its tidal forces in the Earth's oceans but beyond that they have little time for thinking outside the box. It is now emerging that those who reject the idea that factors external to the Earth can have a significant influence upon the Earth's climate are increasingly at odds with the evidence. One quirky way to show that this is the case is to reverse the argument around. This can be done by asking the question: Is there any evidence to show that the Earth can have a significant influence upon the Moon and nearby planets? If this is indeed the case then would it be so hard to imagine that it might possible for the reverse to happen (in specific cases). One piece of evidence that shows that the Earth can have a significant impact upon external astronomical bodies is the gravitational interaction between the Earth and Venus. Every time the planet Venus passes between the Earth and Sun it presents the same face towards Earth. This happens because the slow retrograde rotation rate of the planet Venus (approximately 243 days) has allowed the Earth's gravity to nudge Venus's rotation period into a resonance lock with the Earth's orbital period. We now have an addition piece of evidence to support the idea that the Earth can have a significant influence upon the Moon. Thomas et al. 2015 (1) report that imaging by the Lunar Reconnaissance Orbiter Camera (LROC) has revealed the presence of over 3,000 geological faults known as lobate scarps. Indeed, it has emerged that these globally distributed faults are the most common tectonic land form on the moon. Initially it was thought that the lobate scarp faults were created by the gradual shrinkage of the Moon's crust as it cooled. However, an analysis of the orientations of these small scarps has yielded a very surprising result. It shows that the orientation of the fault lines is being influenced by an unexpected source--gravitational tidal forces from Earth. said that: "There is a pattern in the orientations of the thousands of faults and it suggests something else is influencing their formation, something that's also acting on a global scale -- 'massaging' and realigning them." The fault scarps are very young -- so young that they are likely still actively forming today. The team's modeling shows that the peak stresses are reached when the moon is farthest from Earth in its orbit (at apogee). If the faults are still active, the occurrence of shallow moonquakes related to slip events on the faults may be most frequent when the moon is at apogee. This hypothesis can be tested with a long-lived lunar seismic network. NASA/Goddard Space Flight Center. "Earth's pull is 'massaging' our moon." ScienceDaily. ScienceDaily, 15 September 2015. The question now becomes, why is it so hard for scientists to admit that factors external to the Earth could have a significant impact upon the Earth's climate.